What a technical home run. If you need any more motivation to engage in cool robotics projects, just check out the reaction when the test subject figures out he can feed himself for the first time in 26 years. That’s social impact. From the IEEE Spectrum site. Maker Faire This Weekend: Don’t Miss It! This has become one of my favorite events anywhere, anytime. You’ll find a great collection of art, technology, science projects and demonstrations, contests (like the “King of Fling” catapult contest) kits for sale, tools…and of course the people that make and use them! It is a completely unique collection of interesting things and people. I strongly recommend the Faire to any family that can make it to the San Francisco Bay Area this weekend, not just the nerds among you. There really is something for everyone. Even my one-and-a-half-year-old daughter was enthralled last time around, so don’t miss it! Click on the picture link above for more info and tickets! Don’t miss this week’s Make Magazine blog feature podcast on weekend starter robotics projects with pdf hardcopy support this week. It’s a great source for parts, kits, how-to videos and general tutorial resources. The kits and instructions are PERFECT for first-time electronics hackers and roboticist wanna-be types. The materials costs are modest and the projects can be completed and tested inside a few hours. and kits for those less inclined to scour the junk bins and create your own, Check out PagerMotors.com and Solarbotics.com. The tiny kits follow in the fine tradition set by one of my old MIT acquaintances, Mark Tilden, who’s book entitled “Junkbots, Bugbots & Bots on Wheels” is the canonical must-read source on how to build disassemble all those old Sony Walkmen otherwise gathering dust in the junk drawer and use their component parts to build nifty little artificial critters. You can get Mark’s book here from Amazon. Create your very own artificial creatures in a weekend? How cool is that? Here’s a REALLY simple example of how anyone can make a simple motor in about 10 minutes or less from Make Magazine. 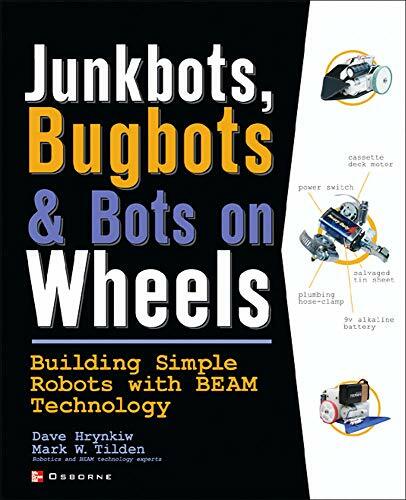 The online Make magazine portal just published a nice article on how to make your very own BEAM vibrobots. For those of you unfamiliar with the BEAM movement, the basic notion is to wire up simple circuits that connect photo-sensors almost directly to motors, so that by shining a light on the simple robot, it will scurry around either towards, or away from, the light thereby mimicking any number of insects. And then, of course, there is all the fun and art in arranging the components to look as insectile as possible. The Vibrobot takes this notion to a minimalist extreme by eliminating wheels, and reducing the number of motors to one tiny pager motor with an eccentric weight attached. When light shines on the photo-cell, the motor vibrates, and with proper sprung leg designs, the robot will scurry along in fine insect fashion. And without the wheels, the vibrobots are ever more insect like in form as well.